A book signing at the New Jersey State Library, Trenton. Born in Manhattan, she was brought by her parents to Long Beach Island, New Jersey, just in time to be evacuated by the Coast Guard during a northeaster. She started her education in a one-room school in Barnegat Light. 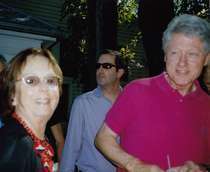 After graduating Cedar Crest College, she and her husband purchased The Beachcomber, a Jersey Shore weekly newspaper. He died two years later and she published it seasonally for 35 years. She married architect Guenter Buchholz and lived in New York City, Princeton and Philadelphia. After a divorce she spent winters in Marin County, CA and Philadelphia, where she indulged her passion, Greek dancing. Buchholz joined a troupe and performed from Washington DC to Boston. 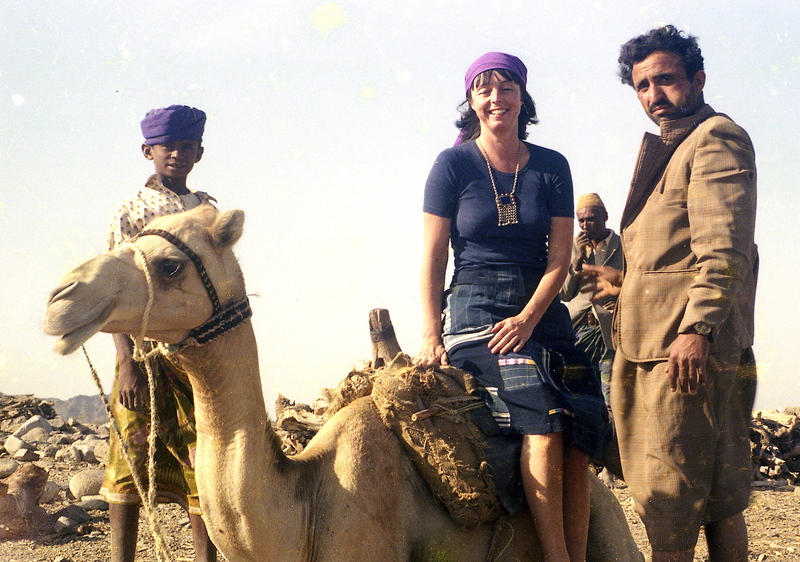 After her children were grown, she roamed the world: from Europe, to Cuba and Central America, to Fiji and New Zealand and the Middle East, including Yemen, Jordan, Syria and the North African countries. She sold "The Beachcomber" to Jersey Shore Newsmagazines, and stayed on as editor. She divides her time between Key West, Maine and Harvey Cedars, on Barnegat Bay, where her family has been coming since the middle of the 19th Century. Promoting "Four Seasons at the Shore," in which 49 photographers and five writers share an intimate connection to place. Margaret Buchholz representing her newspaper, The Beachcomber, in a Rotary Club sponsored elephant race, in Manahawkin, NJ. The author in Yemen, 1979. 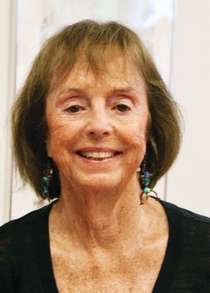 Margaret Thomas Buchholz is co-author of "Great Storms of the Jersey Shore" (1993), which The New York Times called "one of the best documented compendiums ever published of what it meant to be there." She edited "Shore Chronicles: Diaries and Travelers' Tales from the Jersey Shore 1764-1955" (1999), "a real eye-opener," as described by Booklist. She is the author of "New Jersey Shipwrecks: 350 Years in the Graveyard of the Atlantic" (2004), which won the Foundation for Coast Guard History award, "a brilliantly researched chronicle of shipwrecks," Island Album: Photographs and Memories of Long Beach Island" (2006) and "Josephine: From Washington Working Girl to Fisherman's Wife" (2012), "a luminous biography of a spirited woman and her journey through the first half of the 20th century." In 2016 she edited "Long Beach Island Reader," and in 2018 "Long Beach Island Chronicles," both collections of writings about LBI (all Down The Shore Publishing). Her essays about the New Jersey Shore have also been included in the anthologies "Four Seasons at the Shore" and "Shore Stories." This memoir is based on the diaries and letters of a professional woman ahead of her time. In 1918, Josephine left a job on the county daily in Michigan to go to Washington DC to work for the War Department – they were called Government Girls back then. When the war ended she got a job as a secretary and then editor to Frank G. Carpenter, the country’s first travel writer and author of books about his world travels. Her diaries and the photos I show paint a picture of Washington DC at war, almost 100 years ago. 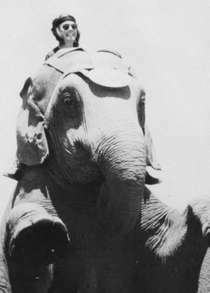 In the 1920s Josephine went to work for Lowell Thomas as a researcher and ghostwriter, traveling throughout Europe in the late 1920s. During this period, she had a harrowing first airplane flight across the English Channel, and just before the stock market crashed in 1929, cruised the Caribbean on an outrageously extravagant trip aboard Count Felix Von Luckner’s four-masted windjammer. She wrote it all down. Photos and readings from the explored diary and letters chronicle early 20th Century optimism and the emerging professional woman. That is Part 1. Josephine married in 1931 and attempted to combine work with motherhood. Part 2 brings the couple to New Jersey in 1933 where they settle on sparsely populated Long Beach Island, Jo's husband’s former summer place. His family import/export business on Wall St. failed in the Great Depression, and she tried to make a living by writing. This part documents finding happiness in a simple life at home, life at the shore during the 1930s, through two hurricanes and World War II, Jo's renewed interest in writing when a new weekly newspaper begins, and her death from cancer in 1959. She is the author's mother. PowerPoint slideshow and readings from Shore Chronicles: Diaries and Traveler's Tales from the Jersey Shore 1764-1955 and Island Album: Photographs and Memories of Long Beach Island. In Shore Chronicles a compelling collection of personal stories begins with adventure travel in 1764 when the shore was still a wild frontier. The book concludes in 1955 with the opening of the Garden State Parkway, which brought Dexponentially more visitors and rapid development — forever changing the Jersey Shore. Island Album is a collection of over 200 photos of Long Beach Island, mostly from the first half of the 20th century. Travel with me “down the shore” as I illustrate the shore experience over the decades. As fresh as their experiences are to the visitors, most activities are timeless — the fundamental attractions of the seashore resonate throughout history. Yet it is stunning to see how different the landscape and environment was before development. Houses evolve from simple shanties into Victorian “cottages” and finally modern structures with walls of glass. But all are home to the families gathered for the camera on porch and dock. Here are stories and pictures of sailing and fishing, of treks by horse, stagecoach, train and car, of beach camping, lifeguards and coastal rescue, of bathing beauties in rented woolen suits and flappers, of violent storms and the endless struggle to resist a hungry sea. And there is regret for wilderness lost and the slower pace of much of the last century. Writing by such well-known figures as John J. Audubon, Walt Whitman, Robert Louis Stevenson, Stephen Crane and Sir Arthur Conan Doyle is included. But, perhaps most interesting are the selections from private journals, letters, and diaries from unknowns vacationing or visiting the shore. A slide show and reading from the dramatic New Jersey Shipwrecks: 350 Years in the Graveyard of the Atlantic takes us on a gripping voyage through the “Graveyard of the Atlantic” -- a name bestowed upon the state’s treacherous shoals and inlets. Before this coastline became a summer playground of second homes and resort beaches, it was a wild frontier of uninhabited and shifting sandbars. From the days of sail to steam and oil, ships (and even submarines) have been drawn to this coast. And for thousands of vessels, it became their final resting place. I explore this history, along with the development of the U.S. Coast Guard from its 1848 origin as the Lifesaving Service, through illustrations, photographs, and readings from the harrowing memories of survivors and observers. I bring my audience into the storm-tossed surf. We are caught in the swirling wreck-filled waters, and fires of maritime disasters like the Morro Castle, and come away with a sense of shared survival as well as respect for the brave heroes and lost souls of this book. Robert M. Browning, Jr., Chief Historian of the U.S. Coast Guard, called the accounts “fascinating and often frightful” and says the book will “entertain and educate readers about the dangers of seafaring and the limits of human endurance.” I was awarded the Foundation for Coast Guard History's annual Regional History Award for this book. This national recognition is presented to an author whose works have significantly contributed to furthering public awareness of Coast Guard heritage. Great Storms of the Jersey Shore is a dramatic history of the major coastal storms that have hit the Jersey Shore throughout recorded history. This slide show is adapted from the book, which is illustrated with nearly 200 photographs, engravings, and maps. We have chosen an exciting selection to fit in the one-hour format, and have added photographs gathered in the years since the book was first published in 1993. A new 2019 edition of this popular book has now been updated by Scott Mazzella, author of "Surviving Sandy," and will include new weather information, storms and especially Superstorm Sandy, and how it affected the Jersey Shore. Scott and I now do a joint presentation. Great Storms of the Jersey Shore combines exhaustive research of archival reports and old news accounts with interviews of more than 200 people who experienced major storms first-hand. It includes extensive narratives of the devastating 1962 northeaster and the great hurricanes of 1938 and 1944. Those who have known the power of the great storms draw us in to a time and place where survival is uncertain. Few persons living at the shore today have experienced extreme storms, but for those who have — as we describe in our readings — it is a defining moment in their lives. This presentation is an opportunity to appreciate the horror and beauty of nature at its most powerful. It covers the whole shoreline, but can be altered to emphasize the northern or southern shore. I would like to offer a program suggestion to you. 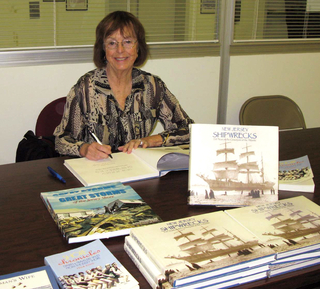 Margaret Buchholz, an author of several New Jersey based nonfiction books, has presented a program at the Bound Brook Library on New Jersey shipwrecks. Ms. Buchholz is an excellent presenter, knowledgeable of her subjects and very pleasant to work with. Her PowerPoint slide show was very interesting and I highly recommend her. She has two additional programs, "Great Storms of the Jersey Shore" and "Celebrating the Jersey Shore" which are described above with her contact information. She is aware that many libraries have tight budgets and is willing to negotiate her honorarium. If you have any questions please let me know.